Having perused Issue Number Nine (July, 1993) of Gettysburg Magazine, I was particularly interested in the article by Mr. John D. Imhof, "Two Roads to Gettysburg: Thomas Leiper Kane and the 13th Pennsylvania Reserves". Mr. Imhof has done a fine job researching and presenting the contributions of Brigadier General Kane and the regiment that he raised to the defense of the Union. However, he has perpetuated a common fallacy, which I feel deserves to be corrected. Although General Kane was present on the field at Gettysburg, the Second Brigade of the Second Division of the Twelfth Army Corps (Brigadier General John White Geary's "White Star" Division) was not commanded by Brigadier General Thomas L. Kane at Gettysburg. Rather, this Brigade was commanded by the Brigade's senior regimental commander, Colonel George A. Cobham, Jr. of the 111th Pennsylvania Infantry Regiment, throughout the entire Gettysburg campaign and battle. "When you write, if you will direct your letters thus, Col Cobham, Comd.,--2nd Brigade--2nd Division--12th A.C.--Washington, D.C. they will come in the head Quarter Mail, and I shall be much more likely to get them than in the Regimental mail, as I am not with the Regt--and of course have nothing more to do with the 111th whilst in command of the Brigade, than with any other Regiment in it." There is no discredit on the part of General Kane in his actions at Gettysburg. He was seriously incapacitated by the effects of previous wounds, captivity, illness, and exhaustion. The weather conditions at Gettysburg were hot and humid, difficult and demanding even for those in perfect health, and combined with his physical circumstances crippled him. He was no coward, this had been well demonstrated on numerous other battlefields, and he remained in harm's way on the field of battle throughout the engagement. However, Kane correctly acted as a professional soldier who recognized that he could not effectively fulfill the responsibilities of his position, and he took the necessary measures to ensure that the soldiers of his brigade were adequately commanded by an officer in full possession of all his physical and mental skills. 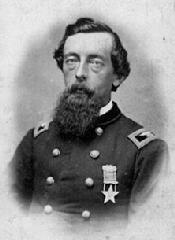 The Second Brigade of Geary's "White Star" Division defended their ground on Culp's Hill with courage, devotion and skill, and none contributed more than their Brigade Commander, Colonel George A. Cobham, Jr. of Warren, Pennsylvania, a man whose role at Gettysburg has been lost to history. I hope that I have been able to, in some small measure, reestablish Colonel Cobham in his rightful command position on the rock strewn slopes of Culp's Hill, Gettysburg, Pennsylvania, on July 2nd and 3rd, 1863. 1 Captain James L. Wells, Truth Vindicated, A Just and True Statement in Correction of the Official Records (privately printed, 1888; reprinted in Henry Cobham, Extracts from Letters of Brig. Gen. Cobham, also a complete vindication by Capt. James M. Wells, 111th Pa. Vols., Warren, Pennsylvania: Mirror Print Co., n.d. located in the Archives collection of the Salvation Army, Alexandria, Virginia). 2 Colonel George A. Cobham, Jr., letters 1862-1864, Warren County Historical Society, Warren, Pennsylvania. 3 Official Records of the War of the Rebellion, Series 1, Volume 27, Part 1, Report No. 302, pages 846 to 848. 4 O.R., Volume 27, Part 1, Report No. 303. pages 848 to 851. 5 O.R., Volume 27, Part 1, Report No. 306, pages 854 to 855. 6 John Richards Boyle, Soldiers True, The Story of the 111th Pennsylvania Veteran Volunteer Infantry, 1861-1865 (Cincinnati, Ohio: Jennings & Pye, 1903 and New York: Eaton & Mains, 1903), pages 123, 125,126,and 128. 7O.R., Volume 38, Part 2, Report No. 204, page 141. 8 A. Wilson Greene, "'A Step All-Important and Essential to Victory': Henry W. Slocum and the Twelfth Corps on July 1-2, 1863" printed in Gary W. Gallagher, Editor, The Second Day at Gettysburg, Essays on Confederate and Union Leadership (Kent, Ohio: Kent State University Press, 1993), pages 93, 101, 102, 109, 131, and 134.